It was unfamiliar territory for the Waianae boys volleyball team, but after settling down and having a little fun, it was business as usual for the new OIA Division II boys volleyball champions. Senior Robert Mokiao led a balanced Seariders attack with 12 kills as Waianae rebounded from a poor Game 1 to defeat Aiea 18-25, 25-20, 25-19 last night in the championship of the Oahu Interscholastic Association Division II boys playoffs at Farrington. 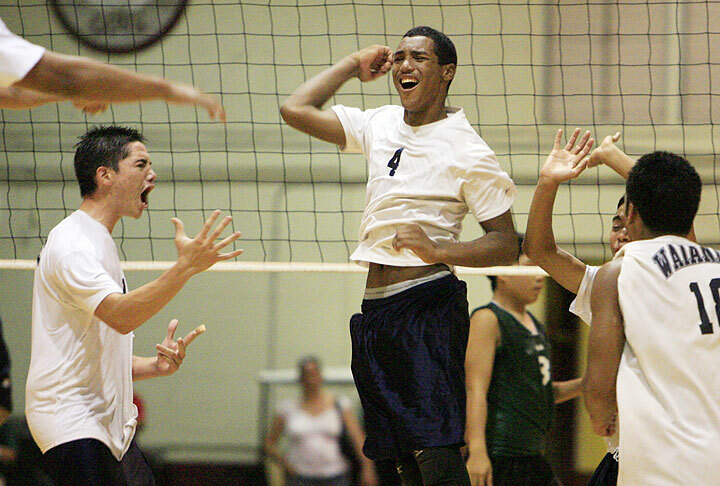 Sophomore Anthony Robinson added eight kills for Waianae (13-0) as the balance of the Seariders overcame the one-two punch of Pili Taitin and Kelii Aleaga, who combined for 26 of Aiea's 30 kills in the loss. "Isn't it beautiful?" Waianae coach Georgieann Keiki said when asked about the balance of her team. "You can go to so many different areas with this team and it's a reflection of how much they love to play volleyball." Casey Seminavage of Waianae put down a kill past Ryan Santiago of Aiea last night. It's the first Division II volleyball championship for Waianae, which also won the OIA crown in 1997, when there were no classification rules. The Seariders will also likely get a first-round bye in the state tournament that begins next week. It seemed that Aiea (8-5), which lost to Waianae twice during the regular season, was primed for the upset early, as the Seariders came out slow and committed nine errors in the first game that Aiea won. "I think it was the nerves and the excitement," Keiki said. "This is unfamiliar territory, so I think they were just a little excited." Mokiao seemed to be the one to get the Seariders on track in Game 2, hammering down a monster kill early that provided the excitement the team needed to get going. "We got a couple of blocks and kills early that were big and got us going," Robinson said. "We got that momentum going and it just carried us through." 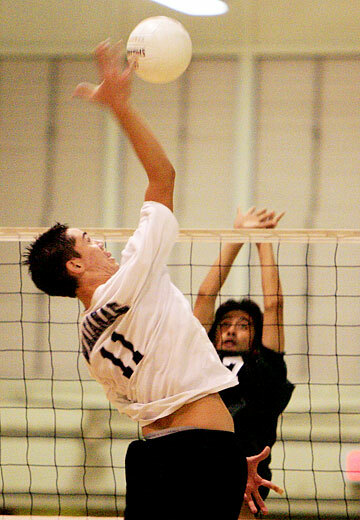 Mokiao finished the second game by hammering down three straight kills to even the match at one game apiece. "Our early struggles were all mental, and once we realized it was up to us to get it done, we came together, everyone was smiling, and we just had fun out there," Mokiao said. Waianae jumped out to a huge lead in Game 3 by scoring nine of the first 11 points. Three consecutive Waianae errors brought Aiea within three points at 18-15, but Robinson put down two kills and assisted on a block to clinch the championship for Waianae. "(Robinson) is our most complete player," Keiki said. "He has the all-around game and came up big for us when we needed it."